Are your ski boots a pain? Are you tired of looking the fool as you clip-clop around après-ski? 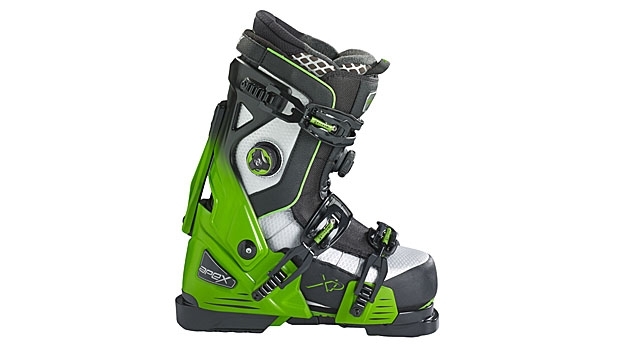 The Apex Ski Boot System solves both problems, pairing modular chassis with a soft boot for the ultimate in strength and comfort on the hill and easy transition to the bar—just click out of the chassis and stroll into the lodge in the walkable boot. The new Apex XP Big Mountain is designed for power and performance, with open three-buckle chassis constructed with nano fibers for added strength. The walkable boot insert includes two Boa closure zones, heat-moldable liner with Thinsulate for added warmth and Vibram IceTrek outsoles for traction in all conditions. Available at Apex Ski Boots.